To determine whether the risk of having an infant with anencephaly or spina bifida is greater among obese women than among average-weight women, we compared 307 Atlanta-area women who gave birth to a liveborn or stillborn infant with anencephaly or spina bifida (case group) with 2,755 Atlanta-area women who gave birth to an infant without birth defects (control group). 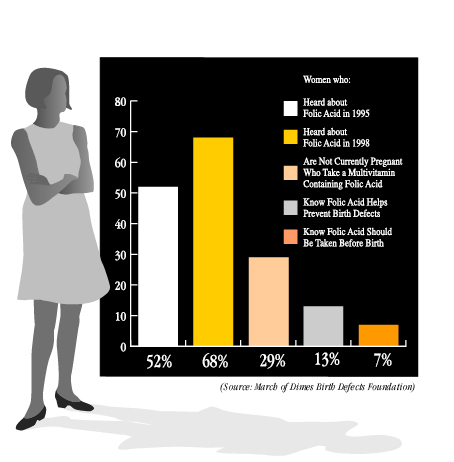 The infants of control women were randomly selected from birth certificates and frequency-matched to the case group by race, birth hospital, and birth period from 1968 through 1980. After adjusting for maternal age, education, smoking status, alcohol use, chronic illness, and vitamin use, we found that, compared with average-weight women, obese women (pregravid body mass index greater than 29) had almost twice the risk of having an infant with spina bifida or anencephaly (odds ratio = 1.9; 95% confidence limits = 1.1, 3.4). A woman's risk increased with her body mass index: adjusted odds ratios ranged from 0.6 (95% confidence limits = 0.3, 2.1) for very underweight women to 1.9 for obese women.